This is my last post for a whole entire week. Yep, this girl and her crazy little family are headed to California for a much needed vacay. I have four gorgeous style bloggers lined up for your reading and shopping enjoyment. Tons of hugs and love go out to Laura, Sheaffer, Amy and Jessica. Just so you know, I have already seen their posts and they are better than anything I could give ya from the beaches and bright lights of Cali. So, pretty please, with cherries on top, show your fun little faces around here while I am gone and I promise to show you mine on Instagram. I wanted to go out with a bang before my vacation started and I think what I am about to tell you will make quite the noise. Let me ask you, have you ever heard of Altar'd State? Okay, me neither, until recently. And I have zero clue why because this store has stolen my heart for many reasons. Not only do they offer some of the most adorable pieces that I have ever laid eyes on, but the owners have hearts of solid gold. In all my years of shopping I have never felt so proud about spending money. Yeah, you heard right, Altar'd State is guilt free shopping at it's finest. Want to know why? When you purchase an Altar'd State piece you are not only going to look fabulous, but you are doing something fabulous. With their exclusive brand, they are giving back through weekly donations, employee volunteer hours and supporting communities all over the world. They are able to feed, clothe, educate and shelter children in need. It's called "Stand Out for Good" and you can learn more about their movement for giving in the Our Story section of their website. I had the pleasure of visiting the Altar'd State store located at The Domain in Austin, Texas last week. Austinites, go now or this weekend or whenever you get the chance. And if you don't live in Austin, don't fret because they have 20+ other stores located in the southwestern region of the U.S. and are expanding as we speak. When I walked into their store I immediately felt it. I felt the passion that this company has for all things good. How many apparel stores do you walk into these days that play Christian music? Not many,if any. It wasn't just about the music, it was about the inspirational messages that scattered the store, reminders about their business philosophy and offerings being right up my alley and yours too, I am sure. I am thrilled to report that Altar'd State will be one of my go-to shops from here on out and you can bet your annual salary that you will be seeing more of this brand on the blog. They are a win-win in my book. Just to show you how generous Altar'd State is, they are offering one reader the chance to win $40 to their online store. If you enter any giveaway, please enter this one and spread the news about this store on Twitter or Facebook. Word spread equals giving spread. Help those in need. Talk to you pretty kitties next week. Hello, California! This song is pretty fitting, just listen. You know you are curious...gotta love some Pat Green. Can I get a heck ya from my Texas ladies? **If you are linking up today, the only request is that you follow my blog with GFC or Bloglovin' and link back to it in your post. It's how weekly link ups work. Oh, and go meet some new friends! Safe travels! The weather is perfect here right now - not too hot, not tool cool (not that it's ever too cool ;). I found this store RIGHT before I started my resolution! I was so bummed, but it will be my go-to next year! Love it! And I LOVE that anchor top. Too presh :) Have fun in Cali! Fun fact: I was born in LA....thank goodness my parents moved to TX, right?! Muah! Love you! Hey while you're in Cali leave your closet unlocked so I can definitely not steal your shoes kaaay thanks :) have an amazing time! Bon voyage Shanna....I'm sure you & your fambam will love California this time of the year!! And way to go with your exit outfit.....way too adorable for words!!!! I love that gives back dress on altar'd states. So glad you introduced me to Altar'd State! I am so in love with so may of their items I don't know if I would be able to only choose one! And I LOVE that they go to a great cause! I love their Cream Color Block Dress, The Laser Cut Sundress, and the A-Line Applique Dress! Thanks so much for sharing! SO cute! And YAY...where in CA are you visiting? Did I miss that somehow?!?! Hope you have a fabulous vacay lady! Enjoy! Great site! I like the Altar’d State Laced Yoke Dress. Those shorts are so cute with the bright pink piping! Hope you have a wonderful time on your trip! Sounds like a wonderful company! Thank you for introducing them to us. I wish they had a store closer to me so I could check them out in person. I am loving the Altar'd State Color Me Maxi Dress, among other things! Enjoy your vacation! I would choose the Altar'd State Wedding Wonder Dress! What an amazing company! 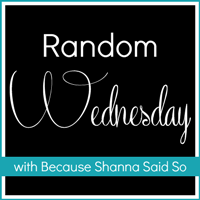 This is my first link up with Random Wednesday and I am glad I chose this week and learned about Altar'd. Have a wonderful trip! Whoo! Have fun in California!! Sounds like a really awesome shop. I can't wait to check it out! Hope you enjoy your trip to California! HAVE FUN!!!!!!!!!!! Can't wait to see what you're up to there on Instagram! Enjoy your vacation time! I love your outfit..the top and shorts were meant to be worn together! Have a fabulous wonderful amazing fantastic vacation!!! Hope you have a blast on your trip! I'm loving those shorts. You look so cute! I've had an altar'd state gift card in my wallet for 6 months now. I need to get in there! Love Altar'd State!! I really want the "Altar’d State Seersucker Dress" that a fashion blogger friend styled for the fourth of July! I would love to find a pink outfit from Altar'd State since I just realized I don't own one piece of clothing! What a shame! I like their cute little faux vest! Have fun on your trip! I love all of the colored denim pieces. Plus a lot of their pieces are made in the USA! Headed my way for vacation? Lots to do and see here in California. Where will you be visiting? Have a great trip!! Definitely sounds like a great company! Those shorts are seriously the cutest ever. You look gorgeous my friend. Have so much fun in California! Love this from top to bottom Shanna! Just gorgeous. Your anchor print top is too cute! I'd get the High-Low Beach Maxi if I won. Have a wonderful vacation in CA! Thanks for introducing me to this store. Theres some many items I love i'd have a hard time narrowing it down to just a few! I am head over heels for those shorts!! Absolutely love them!! Hope you have a great vacation! Ahh, I LOVE Altar'd State! They have some of the best items. They just opened up a store in my town a couple months ago! I have a couple dresses from there... so I would definitely go for another one! It was hard to pick, but I love the Green Sunflower dress! Love the Posey dress..thanks for the chance to win! I adore this entire outfit! I love how everything matches so well! Gorgeous as usual! Nautical prints are soooo in right now. I see them everywhere! Have a great family trip in Cali! yay for vacay! and i would love that poetic eyelet tunic! so pretty! Oh man, the SHOES! I would love the Minnetonka Moccasins! Have a blast in lala land my friend! So gorgeous Shanna, as always! I love the color palette here! have so much fun on vacay!! i love the polka dot posey dress!! I'd get that tie dye maxi!! super cute :) have fun on your vaca!! You look lovely in this. Those shoes are fantastic! have so so so much fun on your trip!!! I am excited for you, and I am even more excited to be visiting you in under 3 short weeks!!! eeeeek!! love you! as always you're rocking it. What a great cause! Have fun in CA. Shanna - I invite you to check out my Fashion Jewelry Shop. It has some lovely costume jewelry and I would love to be featured on your blog. In love with your outfit!! Ahh if I wont i would definitely get that same top you're wearing! I love anything with anchors on it! Thanks for the giveaway! Sorry to be such a copy cat but if I won I'd have to get the top your wearing! Its too cute! But I also like the "Horizontal Lace Vintage Dress"
I love the Altar'd State Color Block Maxi! Have so much fun in Cali!!! Your legs are a mile long in these shorts with these heels! I like the pink piping too. You're coming to California?! If you weren't going with your family I'd ask you to hang out with me! haha... Hope you have an awesome time here! Love the Lost Velocity Lace Skirt! I'd get the Step Aside dress! SO adorable! That shirt is SO cute!! I was going to reply to a question you left on another blog (I think Elvy ?!) about the height of the Torrid Valentino pink studded knock-offs...They are 3". Just the perfect height in my opinion! And super comfortable. The blogger's version was from Ebay and they looked at least an inch maybe even 2+ inches taller. Just my two cents in case you were wondering. :) Enjoy your time here in sunny California!! I love this outfit! Those shorts are so fun! Have a great vaca! Have THE best time in CA...enjoy every second of your much needed vacation! And yes, those ladies are fantastic...looking forward to their posts! Love the Delicate Cascade Dress. OMG I Love this outfit! Great pairings! Your outfit is so cute! I'd use the credit towards an ombre maxi skirt. I bought 3 dresses now could use a skirt. Love the crochet chevron top and the Light in Lace blouse! I LOVE the Baby Doll Belted Dress so much!!! the color of the Kind in Crochet Shift Dress has me swooning! The Laced Yoked Dress is adorable! Perfect for a wedding, baby shower or graduation! I would get the "States of Love" Kentucky necklace! Okay, that top is precious, those anchors!!! I LOVE you in that top! Me thinks you look like a teenager! I would get the Altar’d State Color Block Maxi Dress! Wow! I'm obsessed with the Altar’d State Denim Distress Dress!! I love the crochet chevron top! Have fun in Cali!! I can't wait to see the guest posts. As far as the giveaway - I love the crochet chevron top! You look stunning! LOVE THIS MIX! I would absolutely kill for the Jessica Simpson Catalina Strappy Wedges from Altar'd State. They are so so cute, and I have no wedges in my closet! They're a must-have! I LOVE your look, such a classy and amazing attire, and tha touch of pink is sublime! This is print mixing perfection! Gorgeous as always! If I won, i would get some of the lovely necklaces. I love the Delicate Cascade Dress! LOVE this store! Just found that we have one here in Bham! Loving the accessories right now :) Maybe a scarf or necklace! We have one of those stores here, but I haven't been yet!